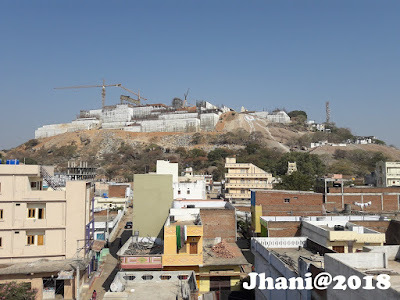 In 1907, Prime minister of Nizam Samstan Kishan Prasadh Bahadur Jagirdaar Maharaja was give the 47.19 Acre as a gift to Yadagirigutta temple which cost in market today 1350 crore rupees. but after independence of India those land given to the Endowment department of state, who never tried to save this land and day by day it was encroached by the leaders and others, on present day only 5 acres are remained there. since 2003 an enquiry is going on, and Lokayukta justice S.Anand Reddy called Endowment commissioner for full explanations about it on December 6, 2010.